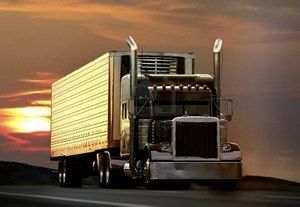 You must understand basic cargo safety rules to get a CDL. If you load cargo wrong or do not secure it, it can be a danger to others and to yourself. Loose cargo that falls off a vehicle can cause traffic problems and others could be hurt or killed. Loose cargo could hurt or kill you during a quick stop or crash. Your vehicle could be damaged by overload. Steering could be affected by how a vehicle is loaded, making it more difficult to control the vehicle. Knowing your cargo is properly secured. What should you do if you do become sleepy while driving? Study sections 2.19 and 2.20 if you can't answer all of these questions. If you intend to carry hazardous material that requires placards on your vehicle, you also are required to have a hazardous materials endorsement. Section 9 includes information necessary to pass the hazardous materials test. After you have driven for 3 hours or 150 miles. After every break you take during driving. Federal, state and local regulations of weight, securement, cover and truck routes vary greatly from place to place. Know the regulations of where you will be driving. Gross vehicle weight (GVW) - Total weight of a single vehicle plus its load. Gross combination weight (GCW) - Total weight of a powered unit plus trailer(s) plus the cargo. Gross combination weight rating (GCWR) - Maximum GCW specified by the manufacturer for a specific combination of vehicles plus its load. Axle weight - Weight transmitted to the ground by one axle or one set of axles. Tire load - Maximum safe weight a tire can carry at a specified pressure. This rating is stated on the side of each tire. Suspension systems - Suspension systems have a manufacturerʼs weight capacity rating. Coupling device capacity - Coupling devices are rated for the maximum weight they can pull and/or carry. You must keep weights within legal limits. States have maximums for GVWs, GCWs and axle weights. Often, maximum axle weights are set by a bridge formula, which permits less maximum axle weight for axles that are closer together. This is to prevent overloading bridges and roadways. Overloading can have bad effects on steering, braking and speed control. Overloaded trucks must go very slow on upgrades. Worse, they may gain too much speed on downgrades. Stopping distance increases. Brakes can fail when forced to work too hard. During bad weather, in mountains, or unique roadway conditions such as driving on gravel or sand may not be safe to operate at legal maximum weights. Take this into account before driving. The height of the vehicleʼs center of gravity is very important for safe handling. A high center of gravity (cargo piled up high or heavy cargo on top) means you are more likely to tip over. It is most dangerous in curves or if you have to swerve to avoid a hazard. It is very important to distribute the cargo so it is as low as possible. Put the heaviest parts of the cargo under the lightest parts. Poor weight balance can make vehicle handling unsafe. Too much weight on the steering axle can cause hard steering and damage the steering axle and tires. Underloaded front axles (caused by shifting weight too far to the rear) can make the steering axle weight too light to steer safely. Too little weight on the driving axles can cause poor traction. The drive wheels may spin easily. During bad weather, the truck may not be able to keep going. Weight that is loaded so there is a high center of gravity causes greater chance of rollover. On flat bed vehicles, there is also a greater chance that the load will shift to the side or fall off. 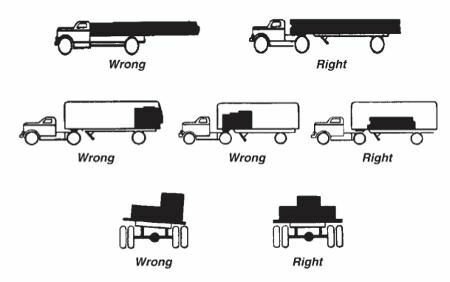 Figure 3-1 below shows examples of the right and wrong way to balance cargo weight. For what three things related to cargo are drivers responsible? What can happen if you do not have enough weight on the front axle? Study sections 3.1 and 3.2 if you can't answer all of these questions. A question may be asked on the written exam about when to check your load securement after being loaded with freight. Remember that you should initially check the load after 25 miles. You might be asked about this on the written exam. Make sure you know to stop after 3 hours or 150 miles (whichever comes first) in order to check the securement of your load. You should also check your load securement any time you stop to take a break. You need to know all of the below definitions. They will come up multiple times during your training and will be referenced in real world conditions as well. So make sure you memorize all of the below terms as well as their definitions! You may be asked about center of gravity on the written exam. You need to know that a higher center of gravity will cause your vehicle to tip over easier than a low center of gravity. The GCWR refers to the total weight of a vehicle, including all trailers. Gross vehicle weight (GVW): Total weight of a single vehicle plus its load. Gross combination weight (GCW): Total weight of a powered unit plus trailer(s) plus the cargo. Gross combination weight rating (GCWR): Maximum GCW specified by the manufacturer for a specific combination of vehicles plus its load. Axle weight: Weight transmitted to the ground by one axle or one set of axles. Tire load: Maximum safe weight a tire can carry at a specified pressure. This rating is stated on the side of each tire. Suspension systems: Suspension systems have a manufacturer's weight capacity rating. Coupling device capacity: Coupling devices are rated for the maximum weight they can pull and/or carry. What is gross combination weight rating (GCWR)? What is a situation where legal maximum weights may not be safe? Weight transmitted to the ground by one axle or one set of axles. Maximum GCW specified by the manufacturer for a specific combination of vehicles plus its load. Total weight of a powered unit plus trailer(s) plus the cargo. Total weight of a single vehicle plus its load. Do Not Be Top-Heavy - The height of the vehicle's center of gravity is very important for safe handling. A high center of gravity (cargo piled up high or heavy cargo on top) means you are more likely to tip over. It is most dangerous in curves or if you have to swerve to avoid a hazard. It is very important to distribute the cargo so it is as low as possible. Put the heaviest parts of the cargo under the lightest parts. Too much weight on the steering axle can cause "hard steering"
Poor weight balance can make vehicle handling unsafe. Too much weight on the steering axle can cause hard steering and damage the steering axle and tires. Under loaded front axles (caused by shifting weight too far to the rear) can make the steering axle weight too light to steer safely. Too little weight on the driving axles can cause poor traction. The drive wheels may spin easily. During bad weather, the truck may not be able to keep going. Weight that is loaded so there is a high center of gravity causes greater chance of rollover. On flat bed vehicles, there is also a greater chance that the load will shift to the side or fall off. What is gross combination weight (GCW)? Maximum safe weight a tire can carry at a specified pressure. This rating is stated on the side of each tire. How often should you check your cargo to be sure it's properly secured? What accurately defines the term "tire load"? Underloaded front axles (caused by shifting weight too far to the rear) can make the steering axle weight too light to steer safely.